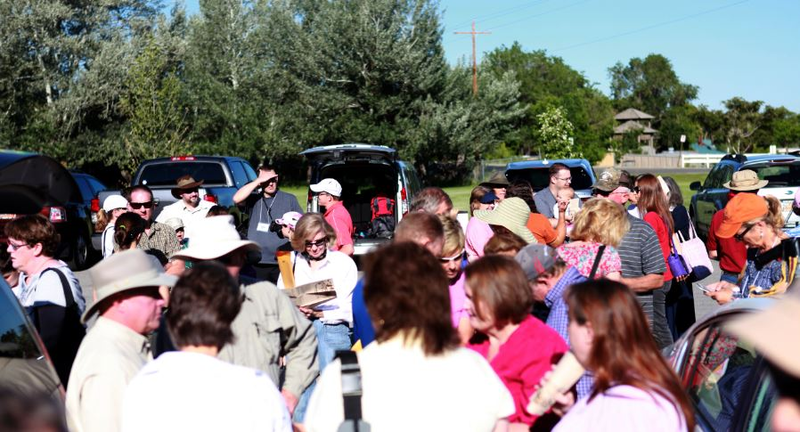 Friday afternoon descendants took self-guided tours of Egan-related sites in Salt Lake City. 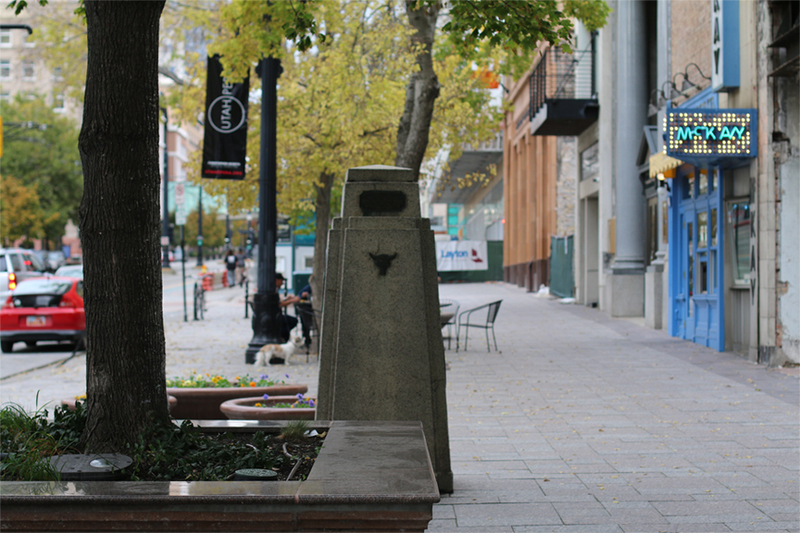 One of the stops was the first pioneer campsite in the valley, located on the block now occupied by the Salt Lake City County building, four blocks south of Temple Square. 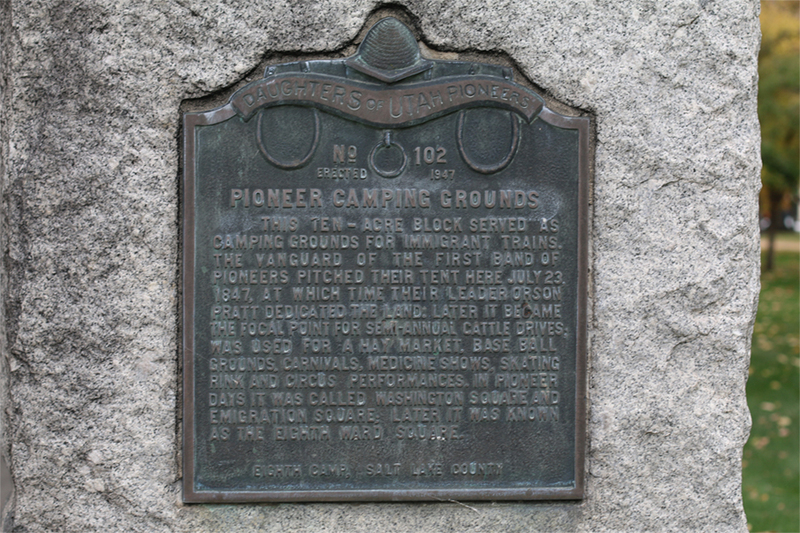 This ten-acre block served as camping grounds for in-coming immigrant wagon trains. The lead group of the vanguard company of pioneers pitched their tents here on July 23, 1847, at which time Orson Pratt dedicated the land. Food was the first priority, and in compliance with Brigham Young’s instructions, within two hours after their arrival, they began to plow. In the afternoon of the same day they built a dam to irrigate the soil, and commenced planting potatoes. Within a week of the pioneers settling in, a fort was erected a few blocks to the west of the camp site, on what is now the northwest corner of 300 West 400 South. It was the first structure built by the pioneers. Homes were erected of logs or adobe, built side by side, with the rear walls forming a protective barrier for the fort. Within the Fort were 423 apartments the saints were supposed to share. Howard and his wives and children lived here for almost two years. 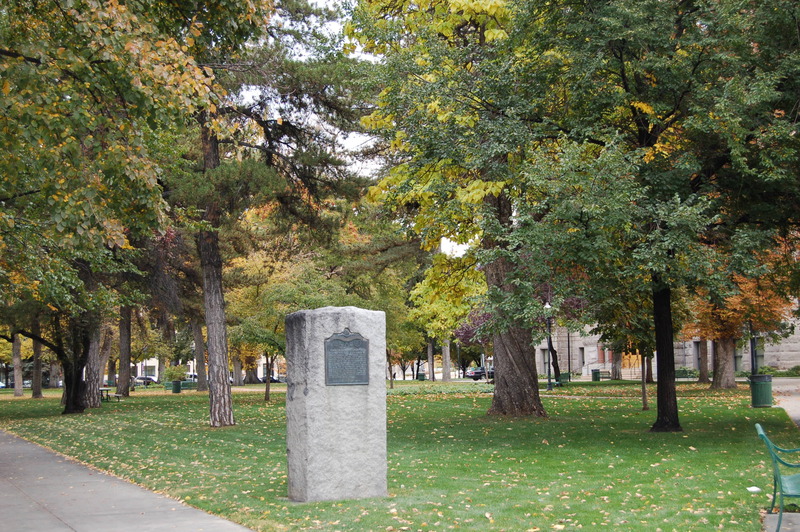 The next Salt Lake City “Egan site” was the Mormon Battalion Monument at the Capitol grounds. 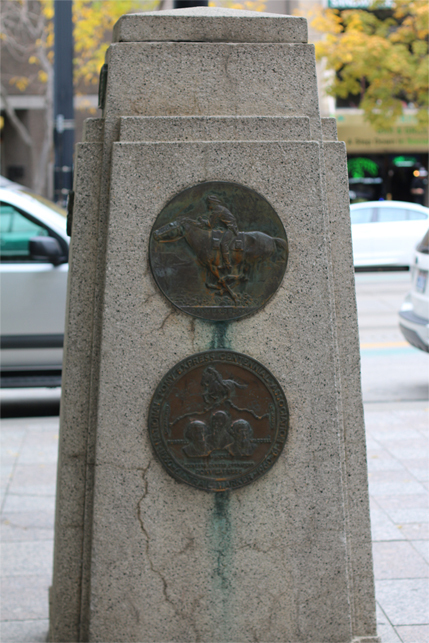 The next Salt Lake City “Egan site” was the location of the Pony Express Office. Howard Egan was the Superintendent of the line from Salt Lake to Carson City. That included supervising the downtown Salt Lake City station on Main Street, which was the principal office for the Pony Express in the intermountain west. This station, referred to as the Salt Lake House, was a “Home Station” – a place where riders were provided room and board. It was relatively large – and for a Pony Express station, rather lavish. The building simultaneously served as a hotel and restaurant for other travelers. Horace Greeley, Mark Twain, and Sir Richard Burton, all stayed as guests of the hotel. 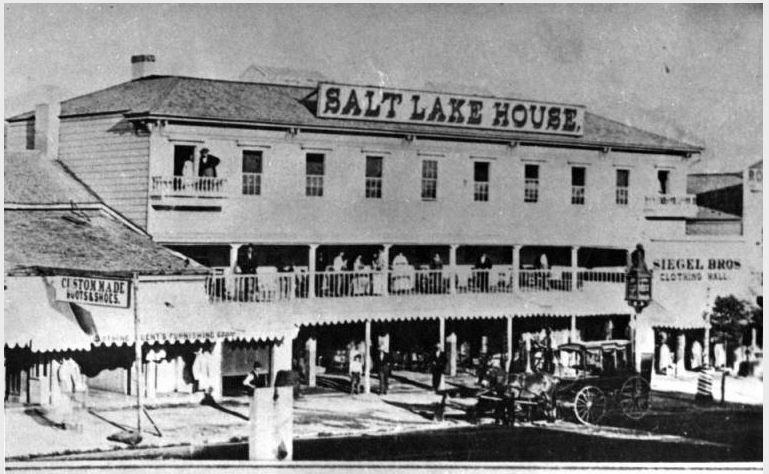 When the telegraph eclipsed the Pony Express system, the Salt Lake House continued to be used as an Overland Stage stop and hotel for several more decades. The next “Egan site” was the location of Howard and Tamson’s principal home. In September of 1851 the Egan family moved into a house with an accompanying livery stable located on the northeast corner of today’s Third North and Third West. Living diagonally across from Union Square, the Egans saw the trail-worn, emigrant wagon trains and handcart companies arrive. That gave the Egans the opportunity to be helpful, and to make the livery stable business profitable. The Egan home had no stoves. All cooking was done by an open fireplace, and each room had one. In March of 1853, the tenant living in the Egan’s south room had let her fire die out, and had borrowed some live coals on a shovel to restart it. But the winds were strong and blew the coals into the barn, which quickly caught fire. The winds fanned the flames, and there was no way to save the barn. The Egans lost all of their chickens and two horses, which burned up in the barn blaze. They also lost thirty tons of hay, a grain-room full of oats and barley, four sets of harness and saddles, and carpenter tools. Fortunately, the house was saved by continuous soaking with water, but suffered some damage. The next Egan site was the Lion House, where Howard helped guard and nurse Brigham Young. By 1875 Howard Egan, at age 60, had exhausted all of his resources at Deep Creek, and returned to live in his home in Salt Lake City. Brigham Young had a long, trusted relationship with Howard that went back to 1845 in Nauvoo. Thereafter, Howard had accompanied President Young on various trips, and was now asked by Brigham Young to guard him, at both the Lion House and the Church Offices. 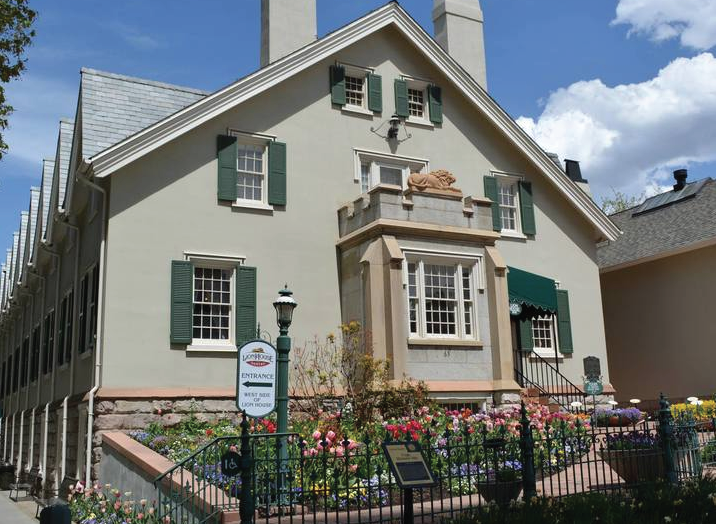 The Lion House was built by Brigham Young in 1856 to accommodate members of his enormous family. He owned residences throughout Salt Lake City and the Utah Territory, but many of his wives and children were housed in The Lion House. On August 23, 1877, Brigham Young suddenly became ill. Six days later he was dead. 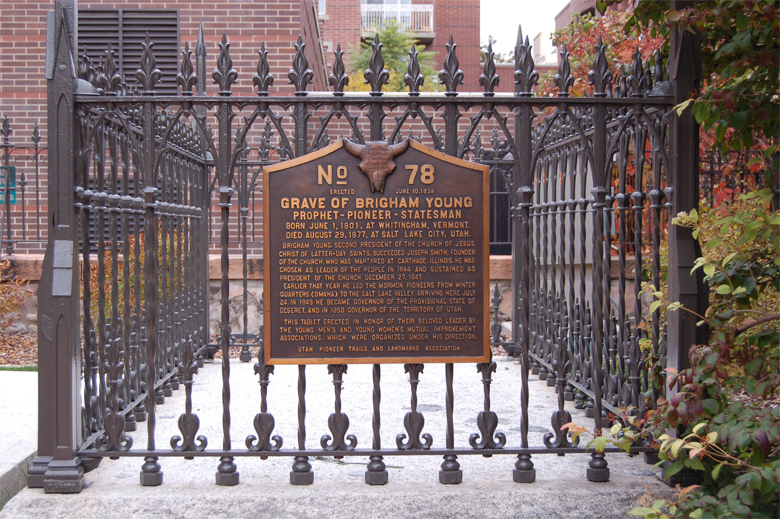 Howard Egan was asked to be a special guard over Brigham Young’s grave, to protect it from vandalism and desecration. Howard and a few others took turns, each doing a shift. Brigham Young’s family cemetery was dedicated to the more than 6,000 Mormon pioneers who died making the journey to Utah between 1847 and 1869. It is the gravesite of Brigham Young, Eliza R. Snow, and other members of the Young family. Prior to the City’s growth, it overlooked Brigham Young’s homestead and the valley he helped settle. 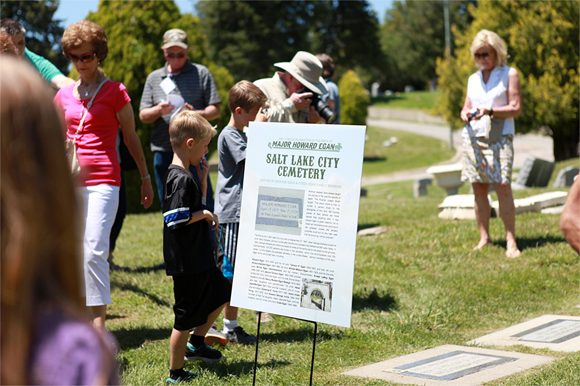 The next stop on the descendant’s tour of Egan sites was the Salt Lake Cemetery. The first burial in Salt Lake occurred on September 27, 1847, when George Wallace buried his child, Mary, just two months after the Mormon pioneers had entered the Valley. In 1849 George Wallace and others surveyed 20 acres at the same site for the area’s burial grounds. Approximately 120,000 persons are presently buried in the cemetery, which now encompasses over 250 acres. It is the largest city-operated cemetery in the United States. Various members of the early Egan family are buried here, including: Howard Egan; his 1st wife Tamson; their 4th child Horace Adelbert; their 5th child William Moburn; and two of their grandchildren. Also buried here is Howard’s 3rd wife, Nancy Redden; their daughters Helen Jeanette and Vilate; and three of their grandchildren. 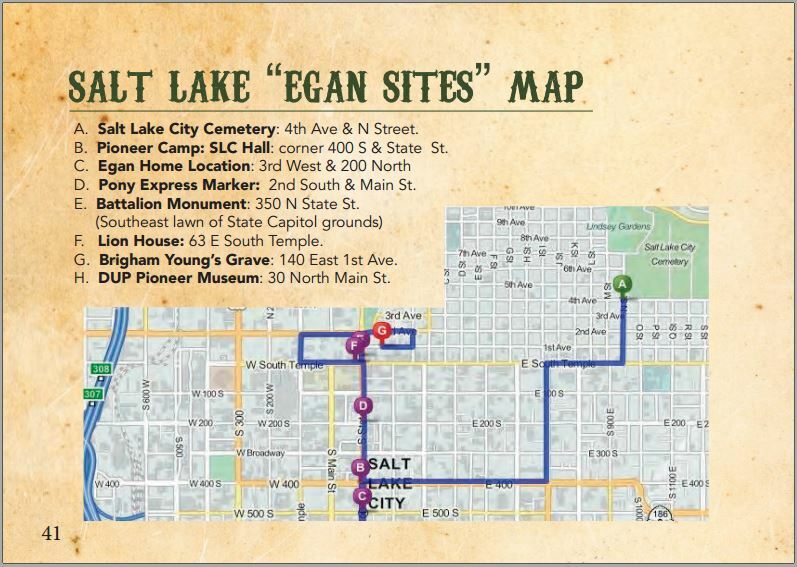 Click–HERE for a MAP of the SLC Cemetery, identifying the location of the Egan gravesites, prepared for the Egan Celebrations by Adam Egan. 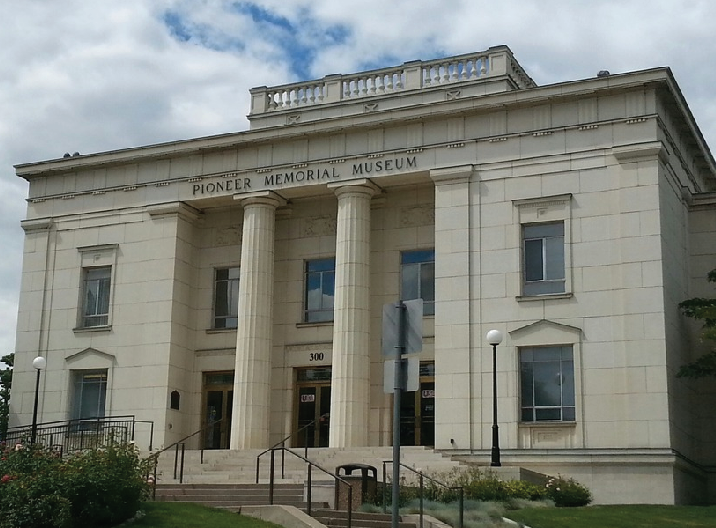 Final stop: the Pioneer Memorial Museum (also known as the “DUP Museum”). 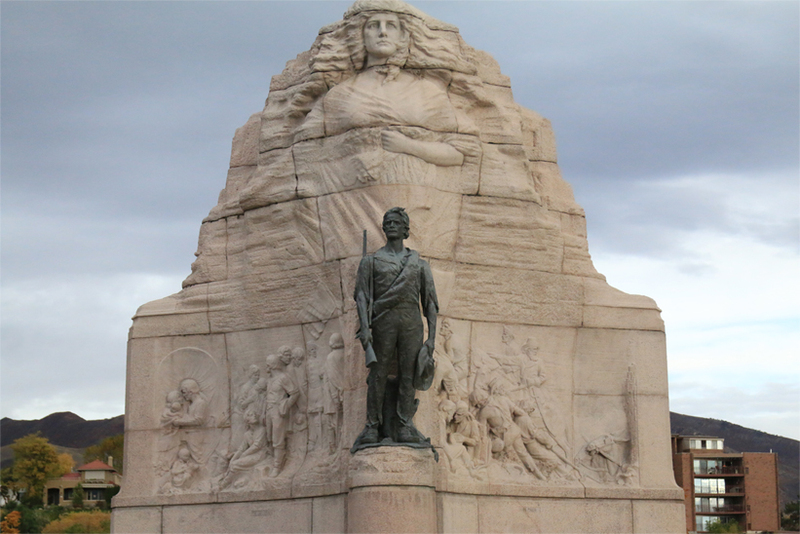 It features memorabilia from the time the earliest settlers entered the Salt Lake Valley in 1847, until the joining of the railroads at Promontory Point in 1869. 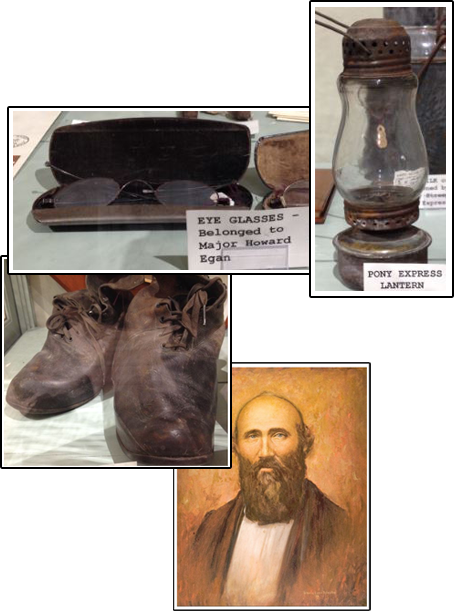 The museum exhibits a number of Egan related artifacts, including: Major Howard Egan’s wooden traveling trunk, his eye glasses; his Pony Express lantern; his tombstone; an oil painting of him; land deeds for property he owned; and letters he wrote and received. artifacts, prepared for the Egan Celebrations by Adam Egan.